Now, to the long and short of it. Short will go first: you need to determine the ideal base product to use and consider the surface on which the coating will be applied. Base products such as laminates often contain dissimilar substrates on either side. This may factor into your adhesive choice. For instance, if the adhesive is to be applied to a film/foil construction, the adhesive needs to have good anchorage on the side to be coated and good heat seal characteristics on the opposite side. In other words, base product selection and orientation impact adhesive choice and end-use performance potential. Substrate thickness can have a bearing on resulting bond potential as well. A thick substrate may have only marginal bond strength during trials, but if the substrate is thinner, the resulting bond might be strong enough to tear the film or laminate, resulting in what is characterized as a destruct bond. To summarize, before choosing a coated tape, know everything there is to know about the substrate or substrates to which the adhesive needs to bond. Bearing in mind that the end use of the tape plays a major role in determining which fusible coating is right for an application, identify all surfaces with which the coating potentially will come in contact. For instance, a tape may need to wrap a wire and bond directly to that wire and to itself at the overlap. A fusible coating that bonds well to the wire jacket may not be the best option when you also want a coating to bond to the backside of the tape simultaneously. Knowing if the coating needs to bond to a smooth surface or a textured one can be critical as well. Most fusible coatings are applied as thin layers, which are suitable for bonding to most surfaces where the tape will experience sufficient pressure, heat, and close contact. But if bonding to an irregular surface where there may be crevices, as is the case with paper, or there are gaps as between parallel wires, a typical coating thickness may struggle to provide enough adhesive for the job. In those instances, a thicker adhesive or even a fusible film may be necessary to provide enough resin to fill in the interstices and achieve the desired bond strength. In some applications, a destruct bond is needed, while others may call for a bond that is light enough to allow peeling by the end user -- maybe during a termination step. To attain a strong bond, the best resin candidate is chosen and matched to the proper coating thickness. Sometimes in the case of a specialized extruded resin or unusual surface, several resins may need to be tested before a clear candidate is identified. In these instances, multiple candidates can be sampled to a customer for in-line trials. Machine trials can be expensive, however, so Chase in-lab testing may be a quick and less expensive option. In order to utilize a lab sealer for comparison tests, slabs of a customer-supplied resin or large enough cut samples would need to be provided so that swatches of fusible coated tapes can be tested side by side. There may be other issues that factor into the coating selection process. One example would be if the coating needs to be applied to a foil surface where electrical continuity is critical. In this case, a full-coverage coating would impede the necessary foil continuity. Chase offers two different coating pattern options for the application of most of its adhesives. Both offer continuity and bonding. These pattern options can also be utilized to achieve other desired properties. If a solid coating provides a too aggressive bond for the end use, that same adhesive coated at 25% or 75% coverage can yield a bond that has peel-back capabilities. 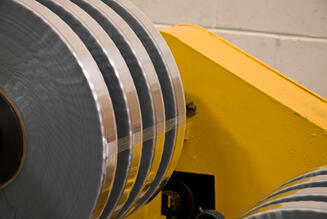 Similarly, our self-lubricating SlickTape coating is applied at a 25% coverage to optimize the applied mineral oil. Adhering to environmental regulations, such as zero halogen, is another example of a special requirement. Most of Chase’s coatings do meet the zero halogen rule, but there are some that still contain halogens because of their unique bonding potential. It would be beneficial to understand this at the outset of a project in order to expedite product selection by ruling in or out particular families of resins. Most all bonding can be achieved by what is classified as a chemical bond. In the case of materials for the wire and cable industry, that bonding typically involves joining a resin to a “like” resin in order to achieve a desirable bond strength. In some cases, though, physical bonds, best described as entanglements, are called for as well. An example is bonding to a textured surface like a nonwoven or bundled structure such as a stranded wire. During the bonding process, the coating or fusible film may adequately flow but ultimately not provide a strong enough chemical bond to meet the desired level. Providing a heavier than normal coating or even a film allows enough resin to wick among the nooks and crannies of an irregular surface and create a sufficient bond through entanglement. Chase offers several different fusible coatings: those that bond to polyethylene or a blended polyethylene, to metal surfaces, to PVC compounds, and to polyester. There even are coatings with properties such that they bond to multiple categories of materials simultaneously. The best fusible coating for your need depends on many of the requirements detailed earlier in this article. Besides fusible coatings, Chase offers a line of pressure-sensitive coated films that bond in situations where heat is not an option. Also available are non-fusible coating applications such as dry self-lubrication, release and water swellable. Now that you know how to go about deciding which coated tapes are best for your wire and cable applications, and you’ve got the lowdown on much of what Chase has to offer, you should be ready to make some decisions. If you’re still uncertain, however, don’t hesitate to call on your representative at Chase for help in identifying the appropriate coated product for your unique cable requirements.